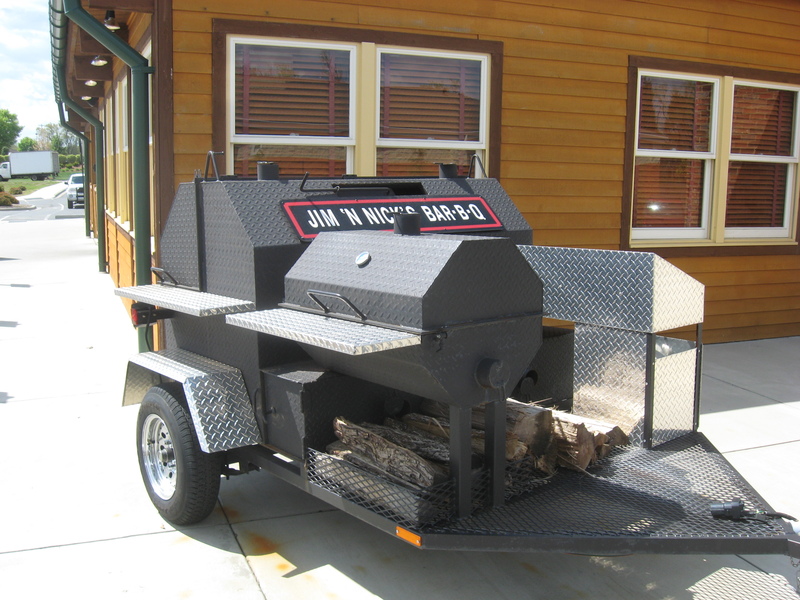 I have met some really wonderful people in the world of BBQ and grilling thanks to the power of Facebook and Twitter! 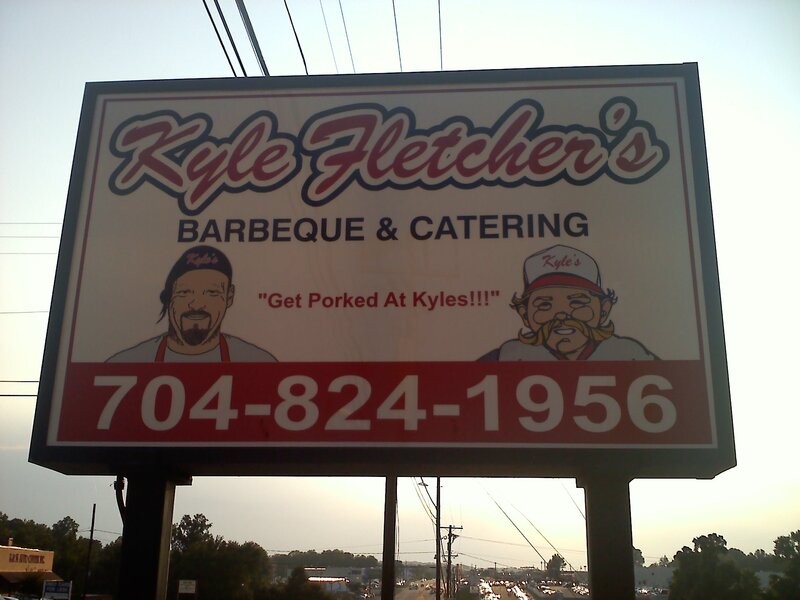 I know I keep saying this, but BBQ and grilling people are some of the most genuine and wonderful people to be around. 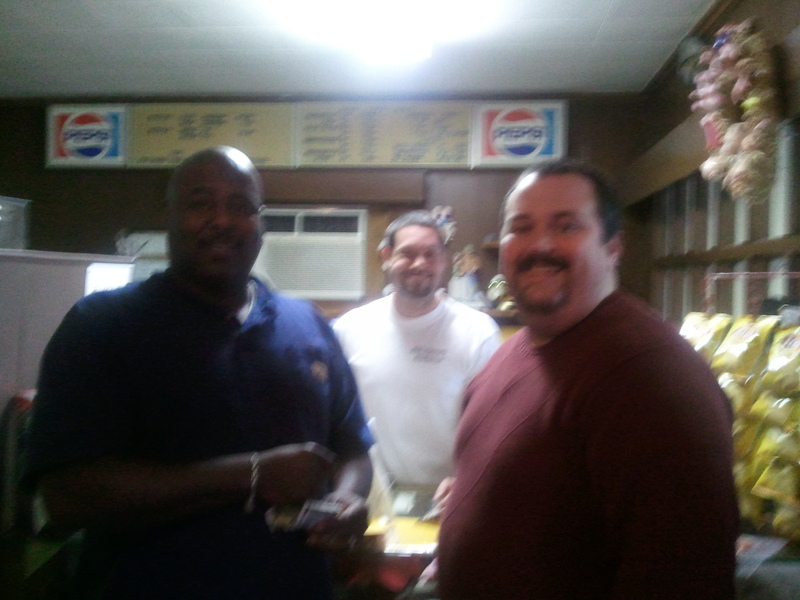 Two of these people are Charles and Allegra Wilson of C-Dub’s BBQ Rub. 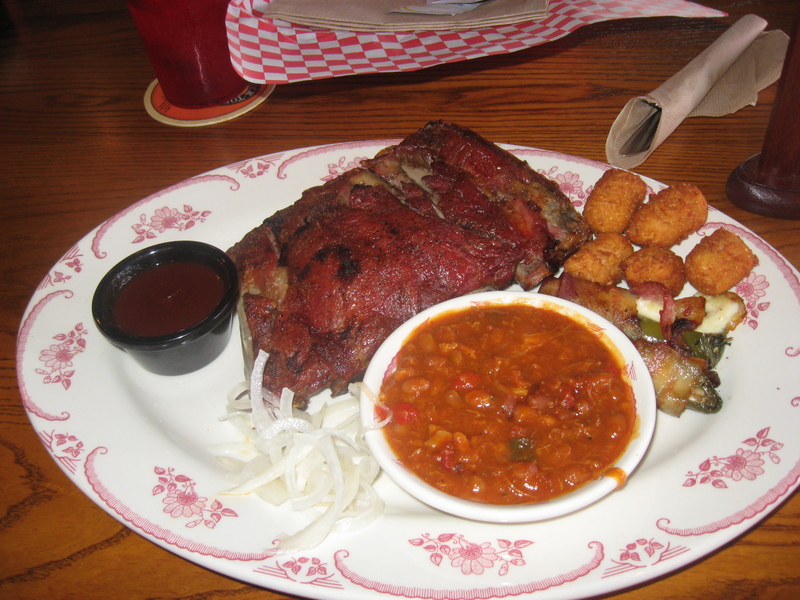 C-Dub’s BBQ Rub is the brainchild of Charles and Allegra. 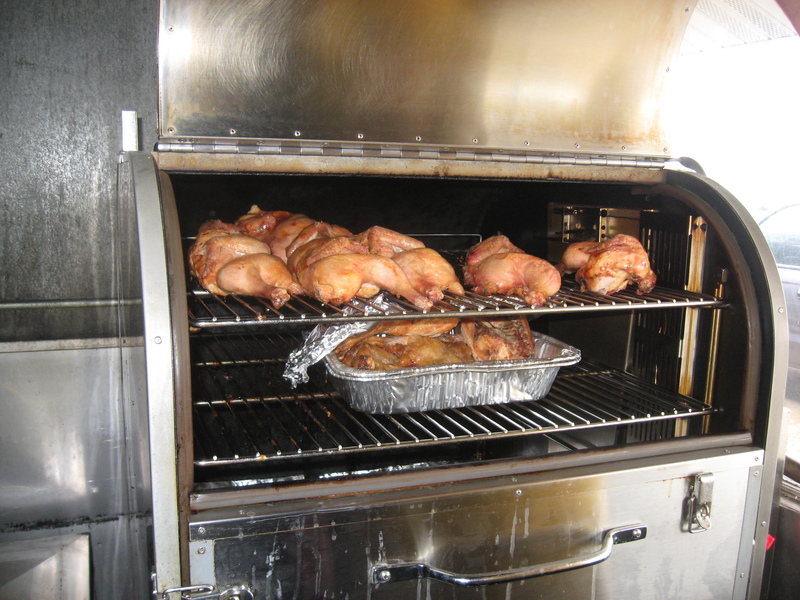 The blending of cultures (Charles is from North Carolina, Allegra is from British Columbia) has helped C-Dub’s in creating outstanding flavors with their line of BBQ rubs and seasonings. Charles and Allegra were in the Charlotte area for the week visiting family, so they were gracious enough to meet up with me for lunch today! 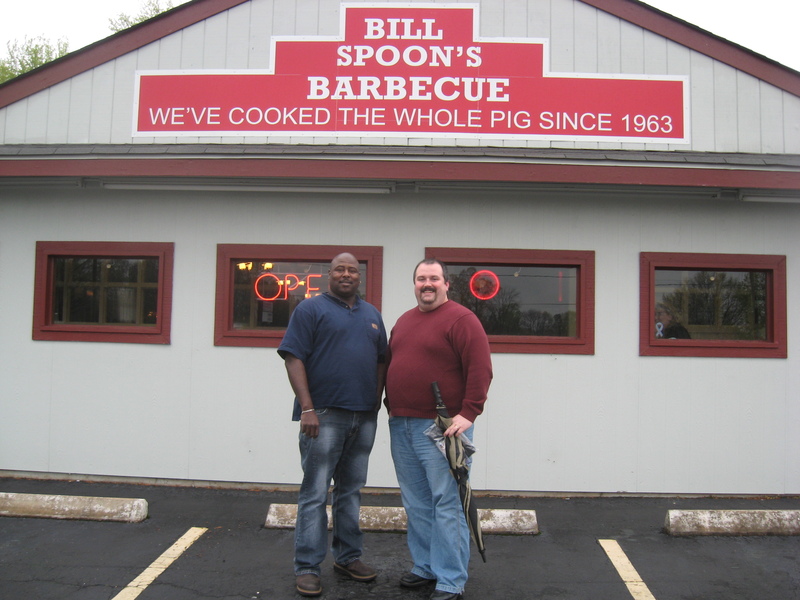 We met today for some Eastern Carolina style barbecue at Bill Spoon’s Barbecue in Charlotte. I had the best time with Charles and Allegra. 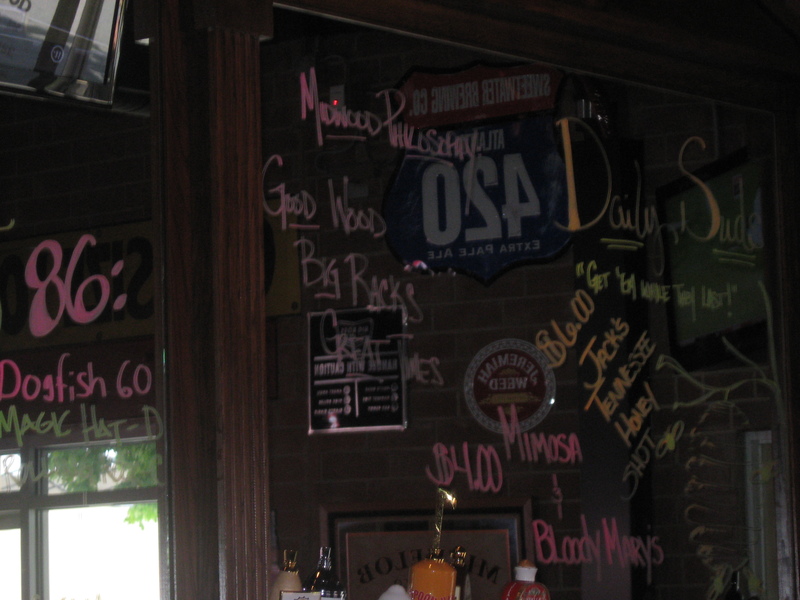 They were very personable and friendly. 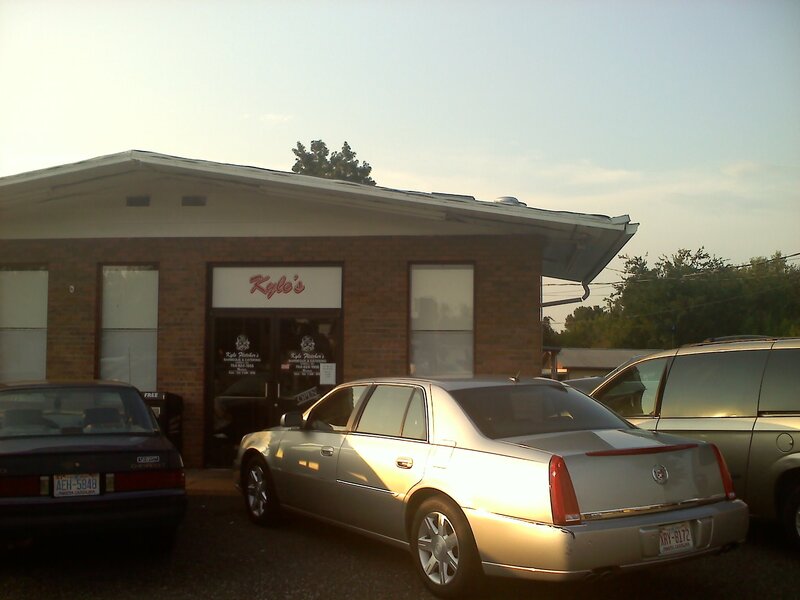 We shared many good laughs and stories as well as some excellent barbecue and dessert. I had such a great time, in fact, that I lost track of time and realized after about an hour and a half that I had to go back to work. Time flies when you’re having fun, after all. Charles and Allegra were also gracious enough to give me a really sweet BBQ apron as well as some rubs that I will be using at the first opportunity. Now I can “Get Naked” every time I fire up the smoker! I was extremely glad to meet Charles and Allegra today. 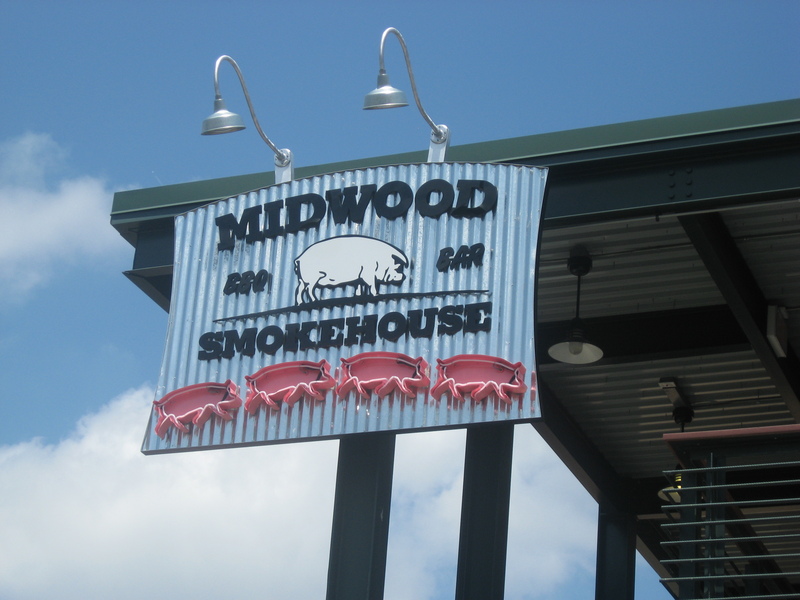 They were an absolute testament to how BBQ and grilling people are genuine and wonderful! I cannot wait until we get the chance to meet up again. 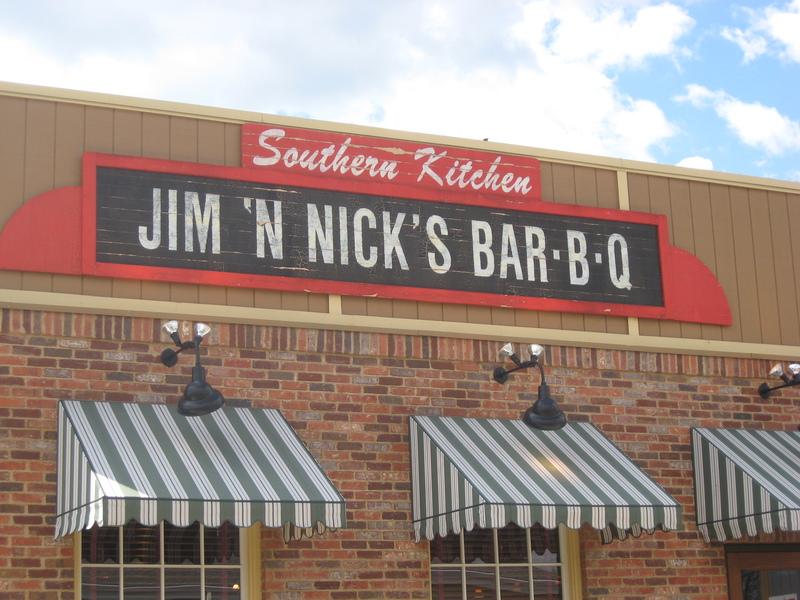 North Carolina likes to lay a claim as the birthplace of barbecue. 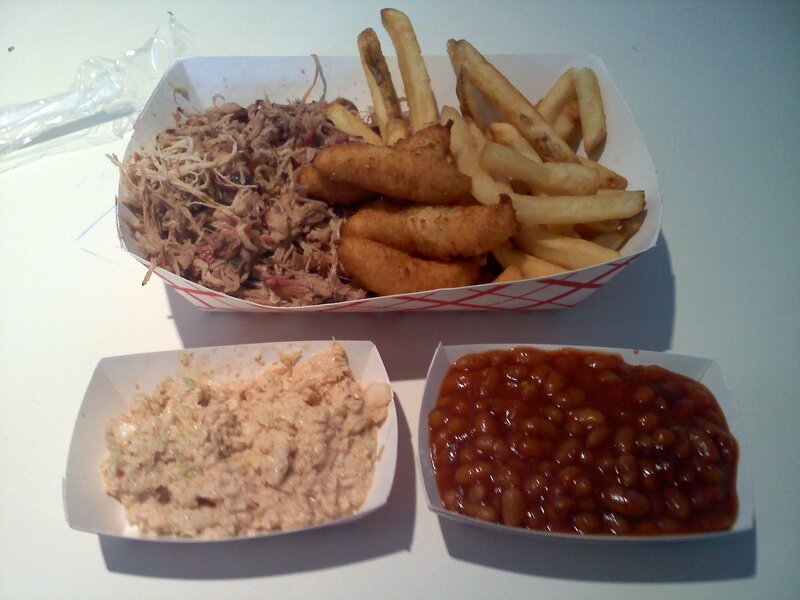 While cities like Kansas City may disagree, there is a lot of history when it comes to barbecue in North Carolina. 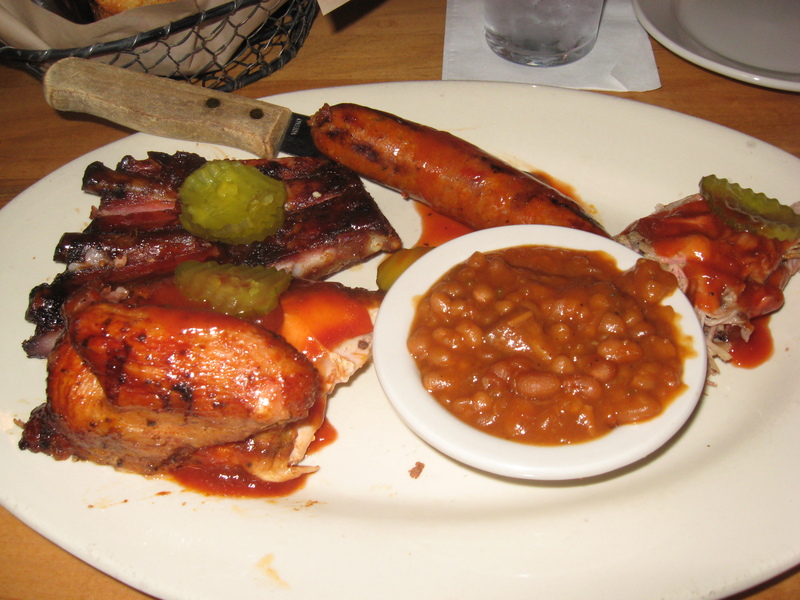 In fact, books have been written solely devoted to barbecue in NC. 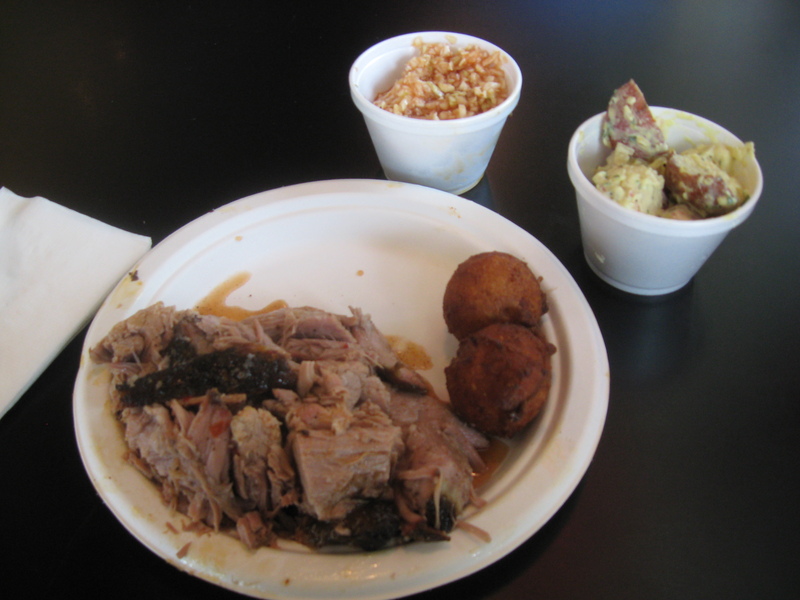 Today, I had the opportunity to try one of the cornerstones of NC barbecue when I had lunch today at Bridges Barbecue Lodge. 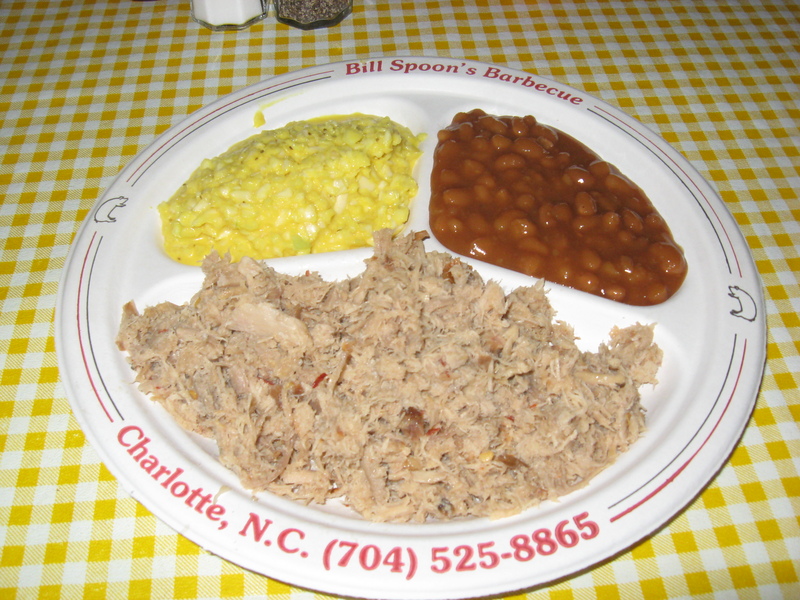 This joint, listed on the NC Barbecue Society’s Historic Barbecue Trail, is located right off of Highway 74 in Shelby, NC. 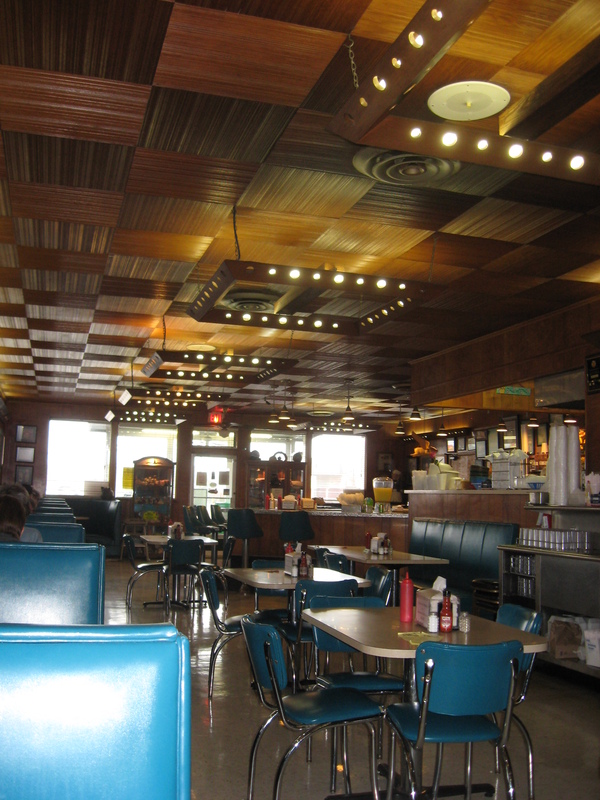 In 1946, Red Bridges (the restaurant’s namesake) opened up his first barbecue joint. 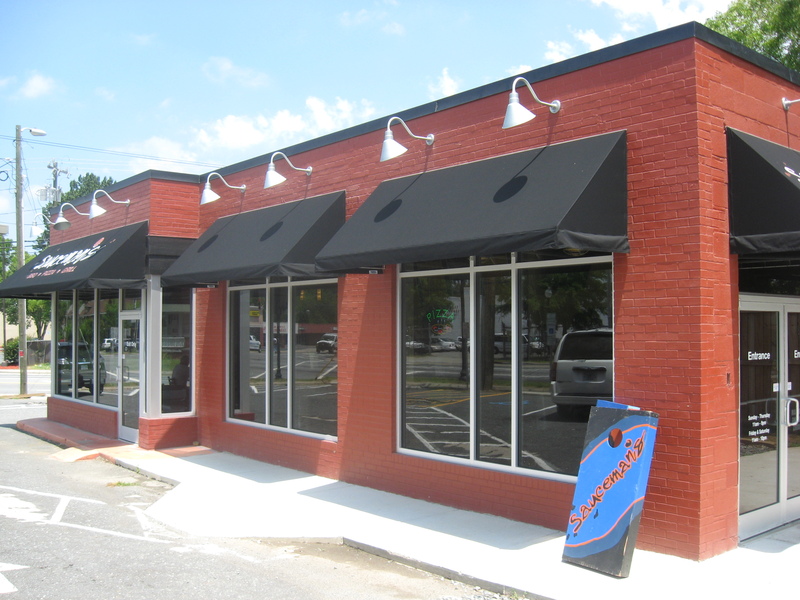 Two years later, Red (along with his wife) opened up another barbecue restaurant in uptown Shelby called Bridges Barbecue. 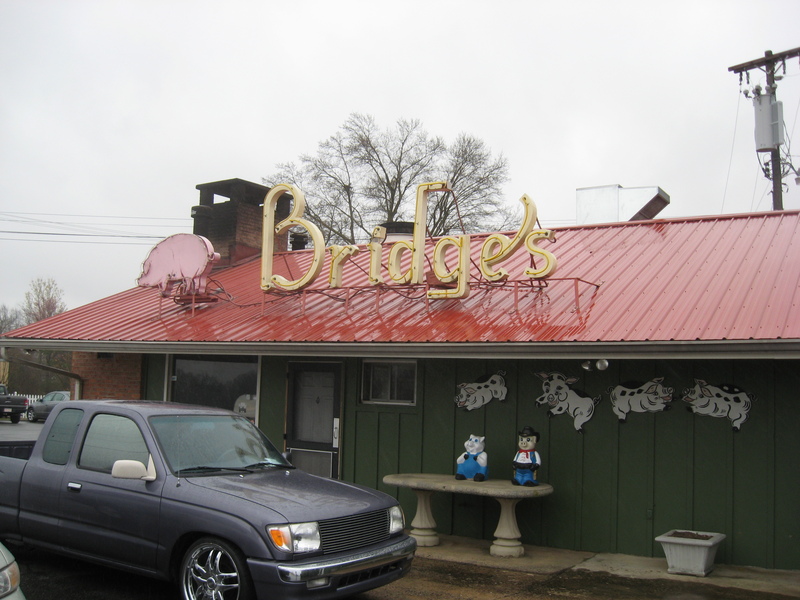 Bridges Barbecue moved to its current location in 1953 and has been operating there ever since. There was not a big crowd as I arrived at 11:30 this morning, so I knew I picked a good time to arrive. 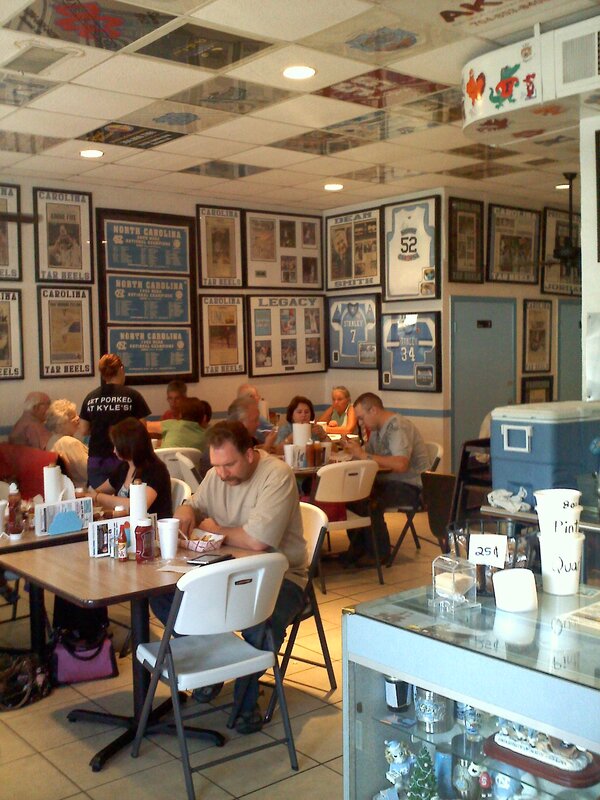 I walk into the restaurant and I immediately feel at home! 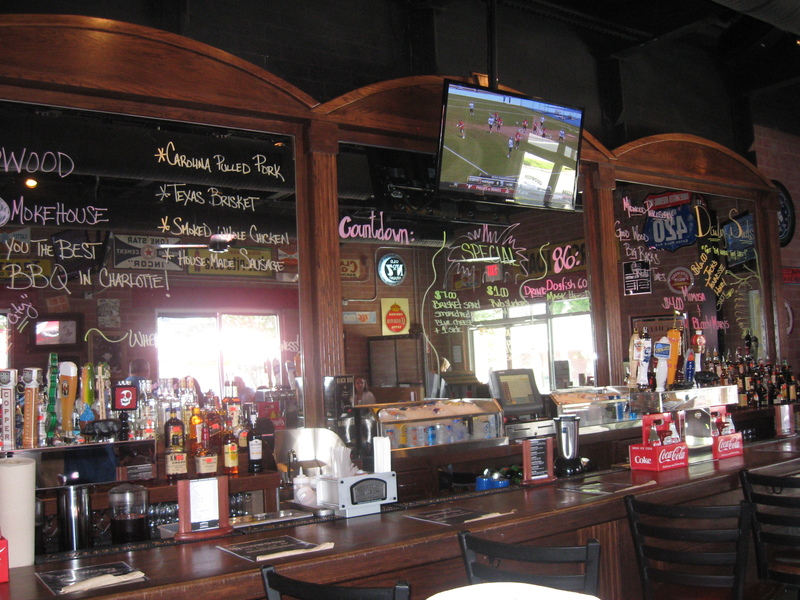 The decor of the restaurant immediately emanates a feeling of comfort and warmth. 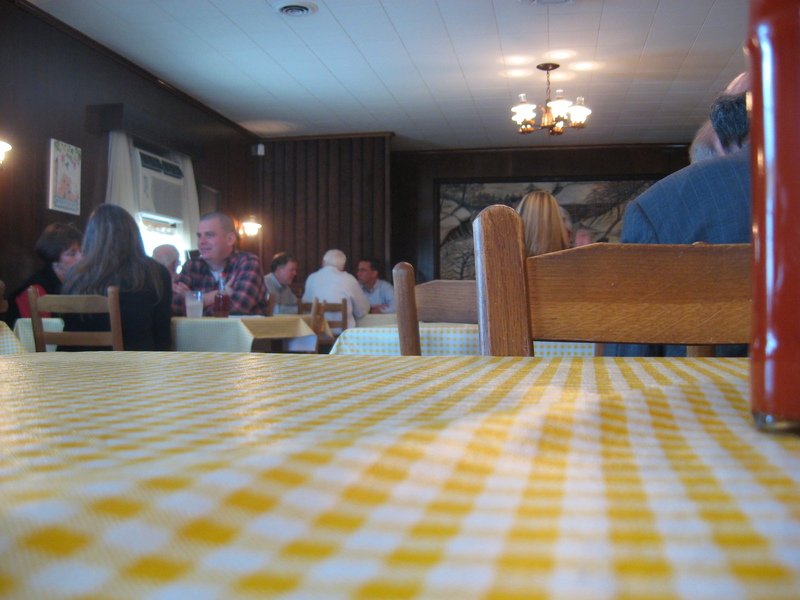 I immediately find a table and sit down. 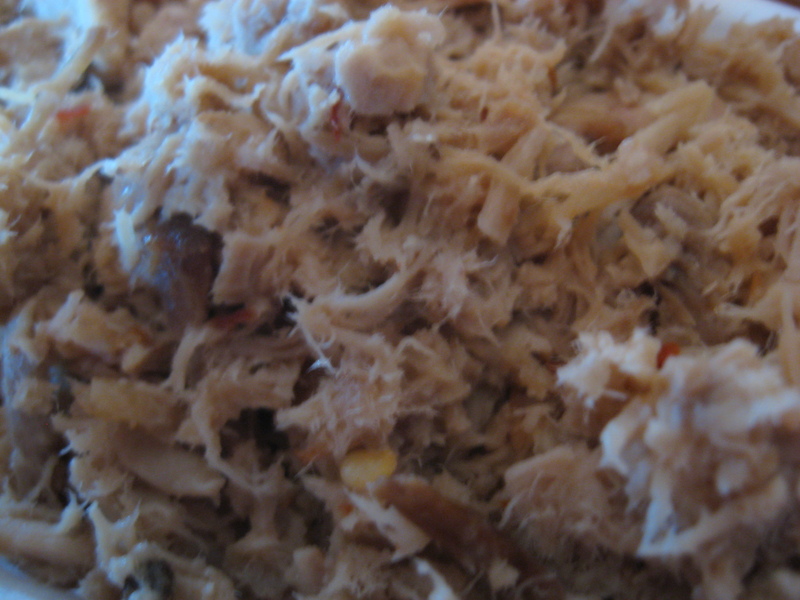 The texture of the pork was more akin to pulled pork than a coarse chop, which was fine to me. 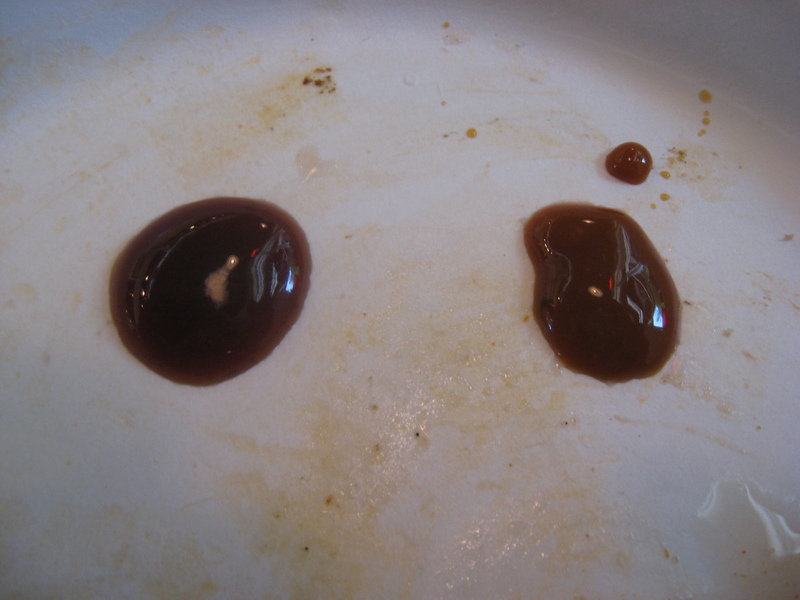 And as you can see, they were generous with the “brown”. 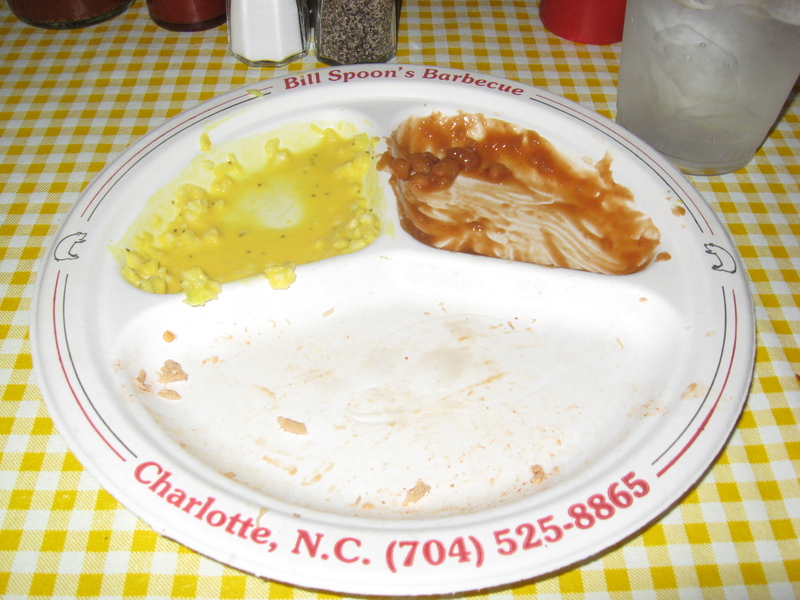 The tray was about the size of a 3″x5″ postcard, filled to overflowing with food. 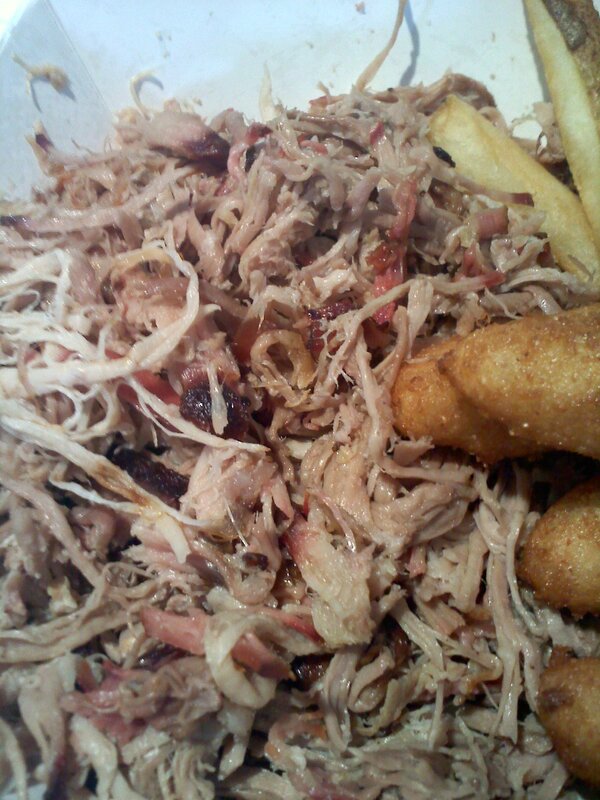 One bite into the pork, and my mouth jumped for joy! 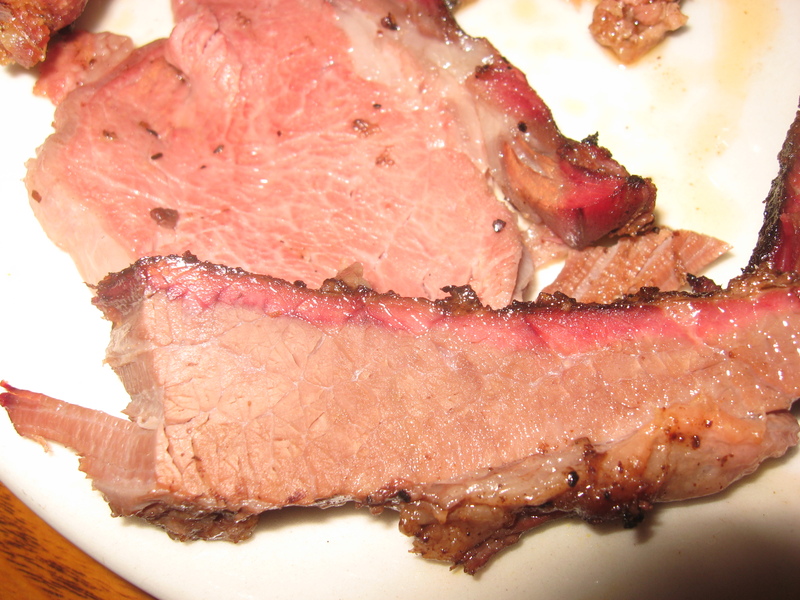 The outside bark was not tough to chew at all, but very crispy and full of flavor. 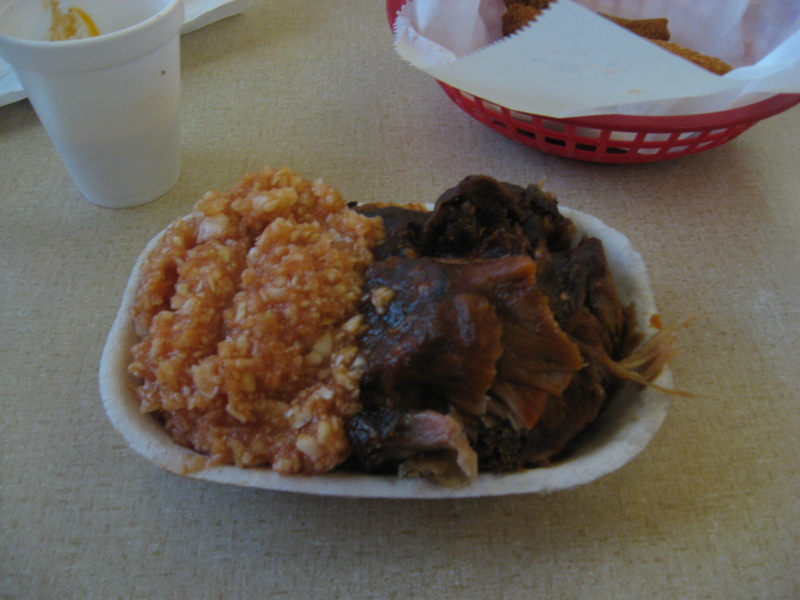 The inside pieces of pork were very moist. 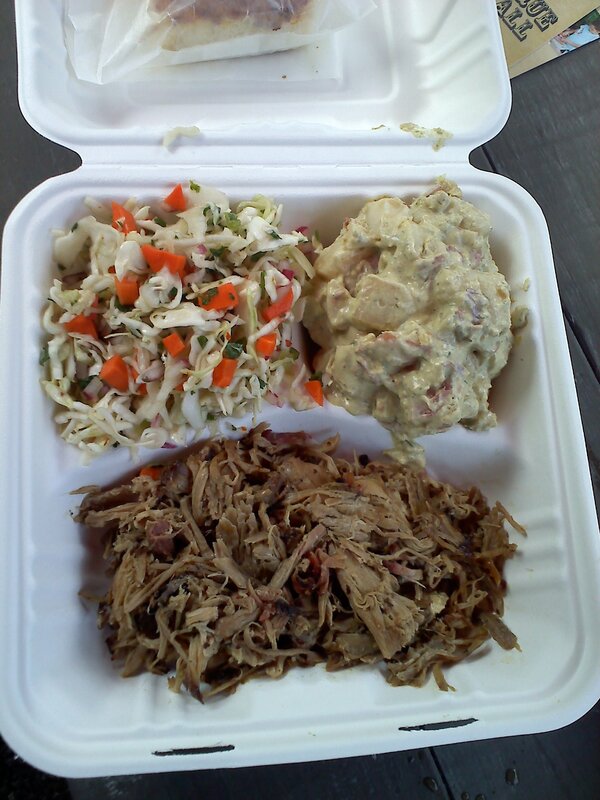 The slaw was very tangy and peppery — a perfect complement to the pork. 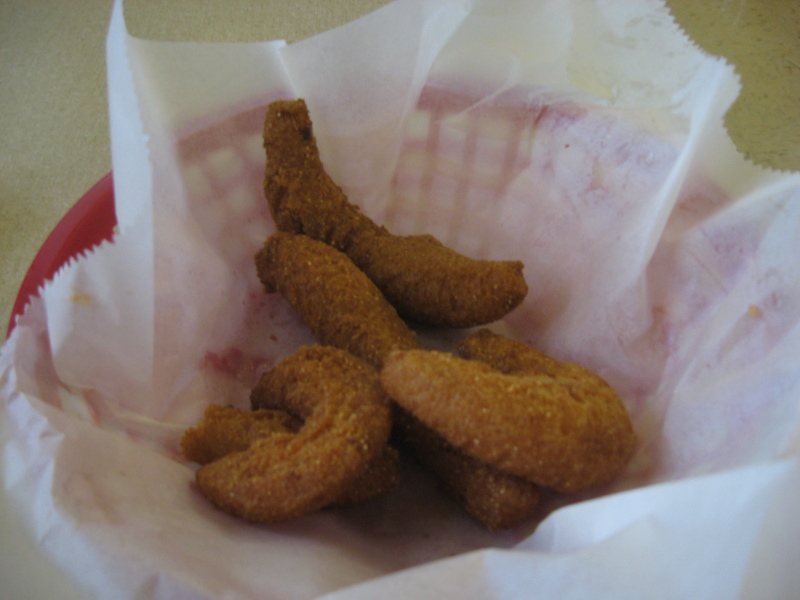 The basket of hush puppies did not contain very many, but I was not concerned because the nice lady who took care of me said I could have as many hush puppies as I wanted. 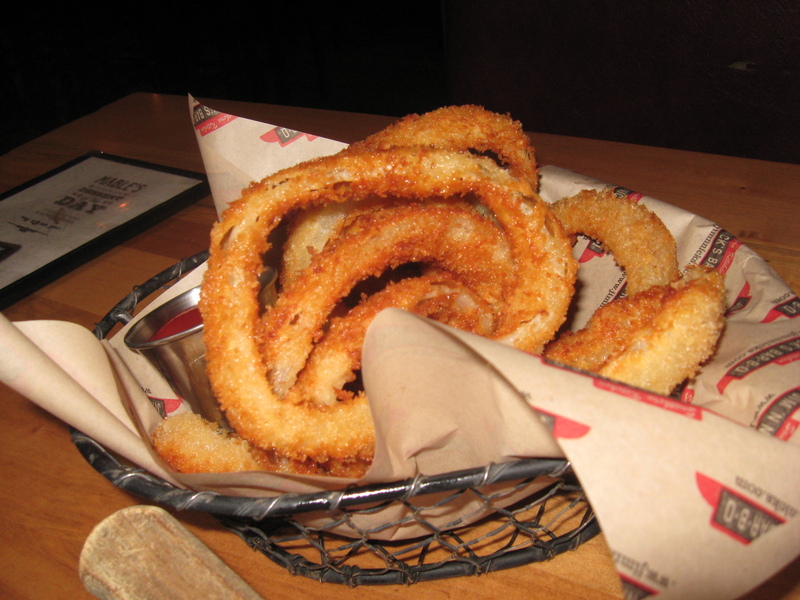 They did not have a uniform shape, but that was okay by me. 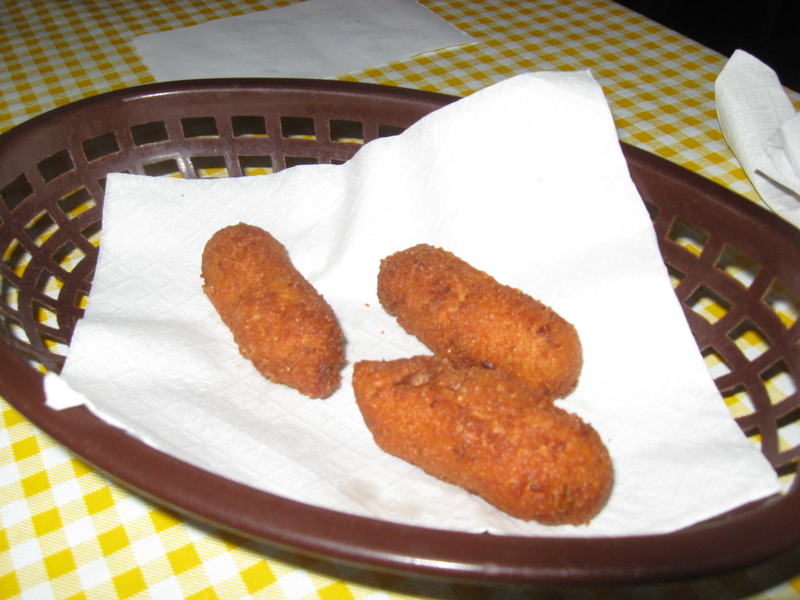 The taste of them is what matters, and they were tasty! 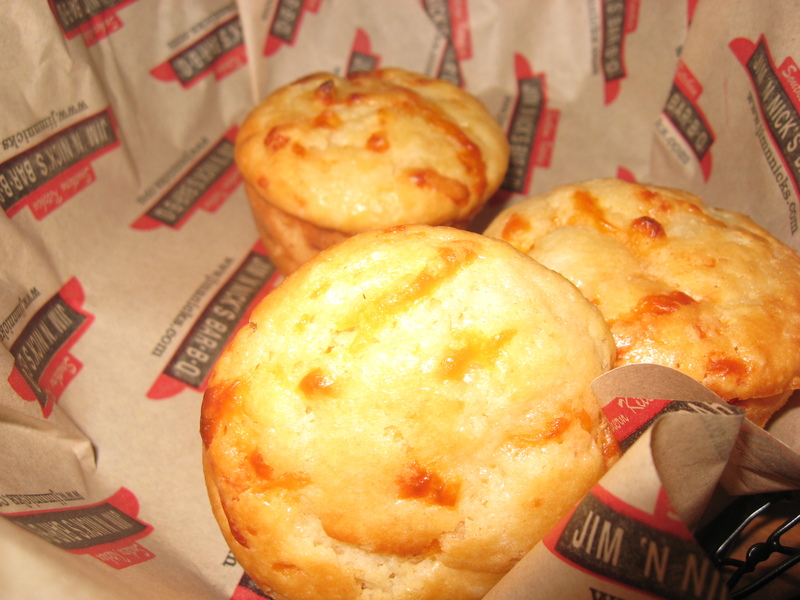 Very crisp on the outside and not soggy at all on the inside. 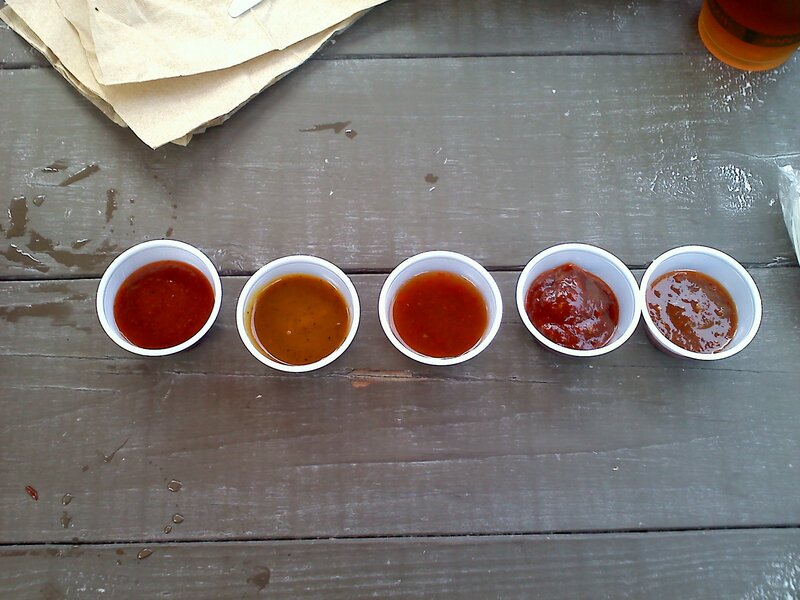 The sauce reminded me of the dip that I had at Lexington BBQ #1. 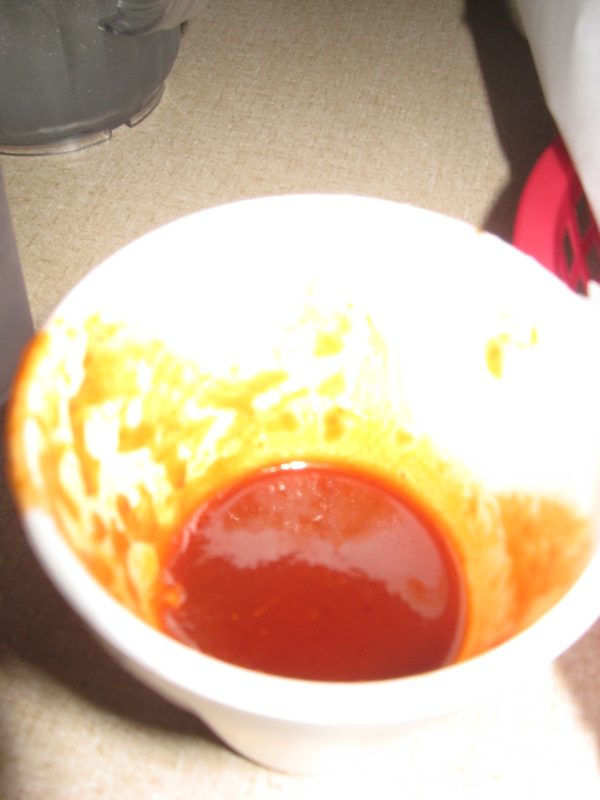 However, this sauce was thicker and more tomato-ey. 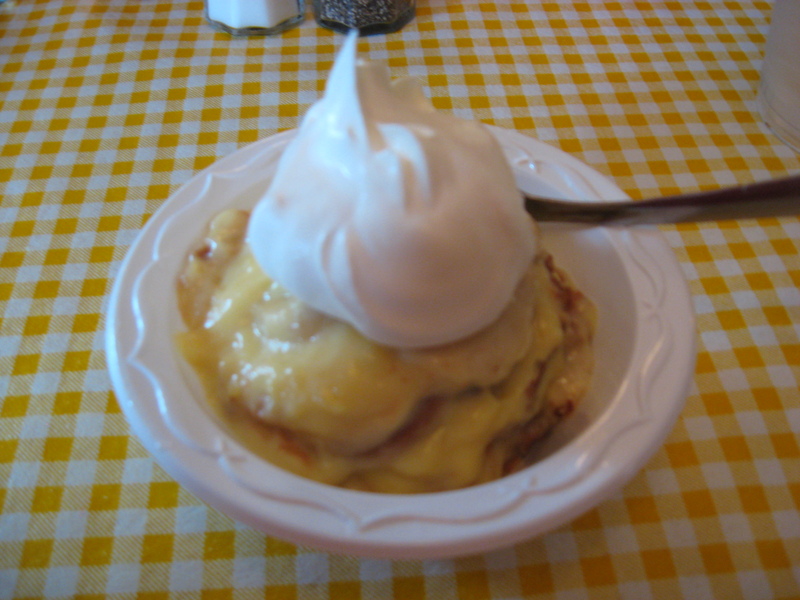 It was sweet and tangy. 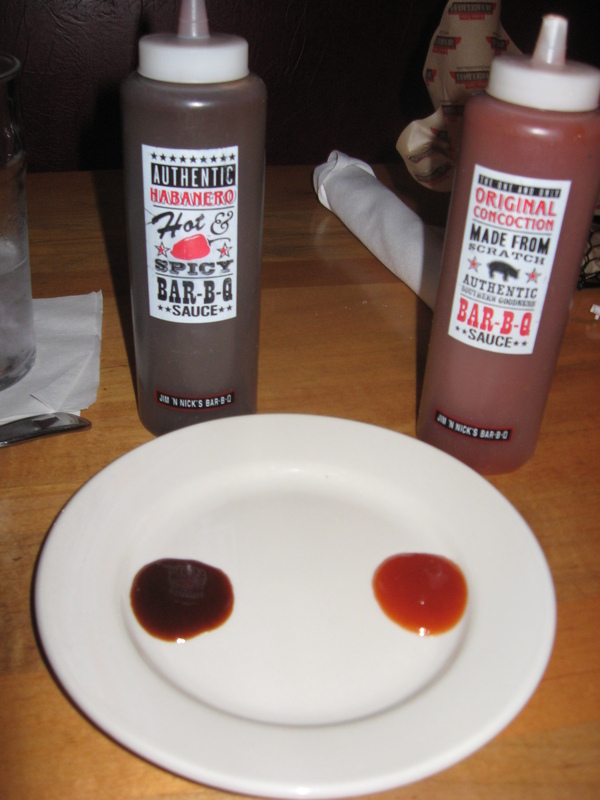 To be honest, it was probably my least favorite part of the meal. However, I didn’t need very much of it. 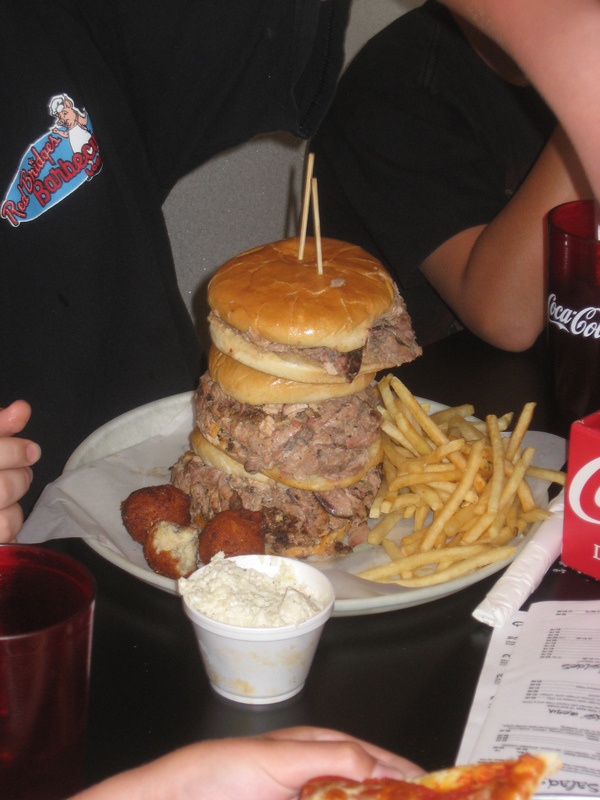 The pork easily stood on its own. 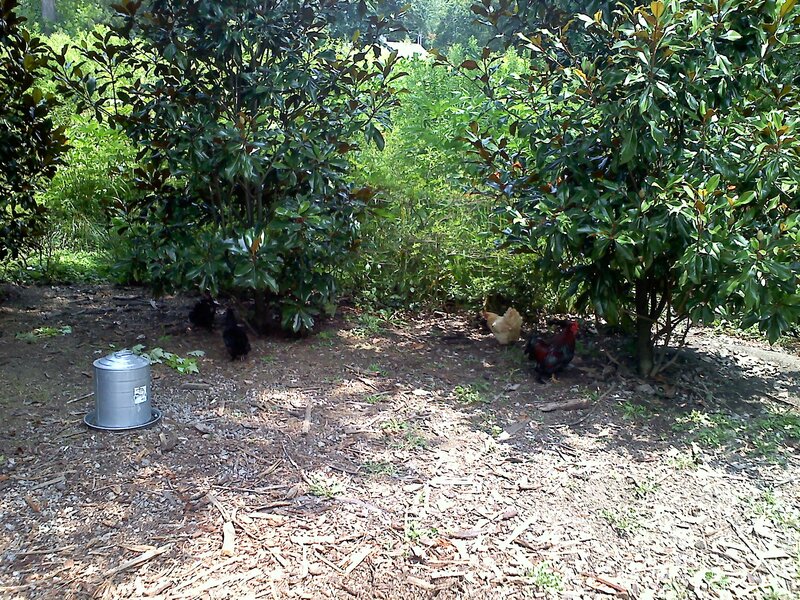 As a nice bonus, I was able to get a sneak peek at the pits. 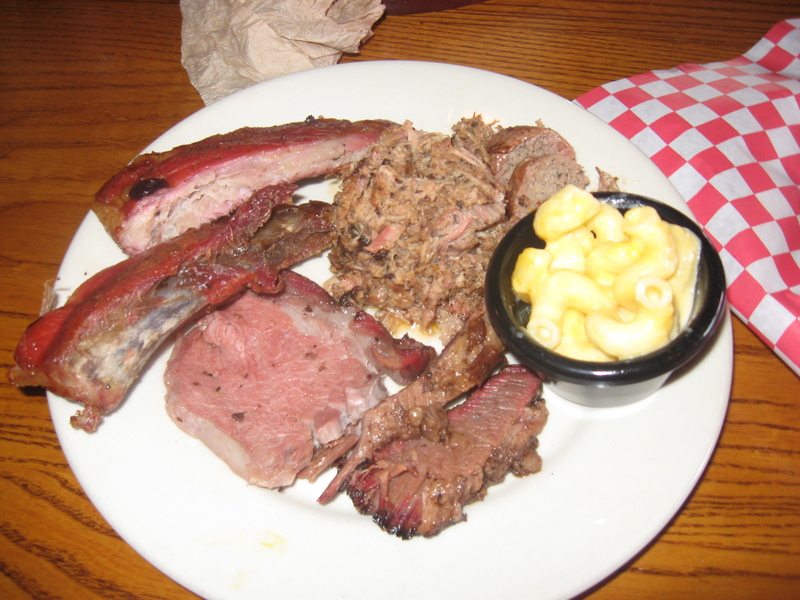 Bridges Barbecue Lodge actually has two different cooking areas. 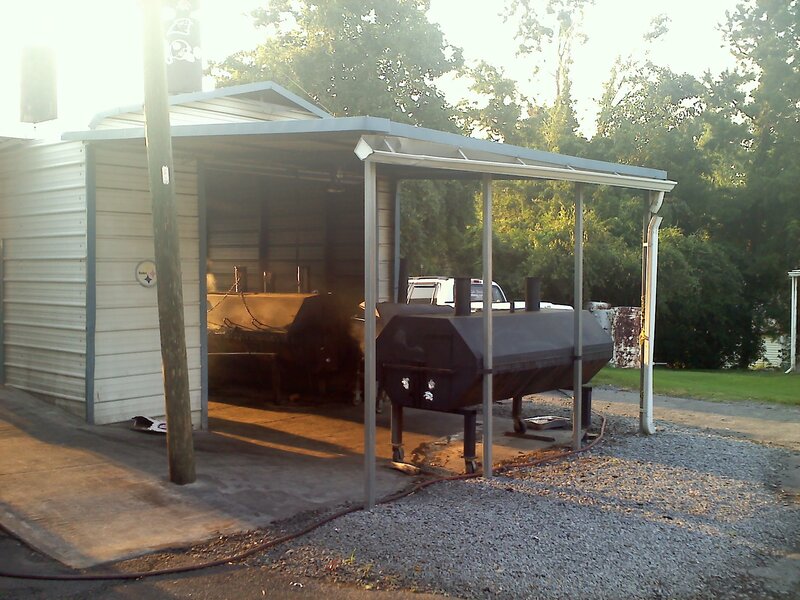 Their main cooking area for the meat consists of an Old Hickory smoker (where they primarily cook chicken) and an old brick BBQ pit (where the shoulder magic happens). 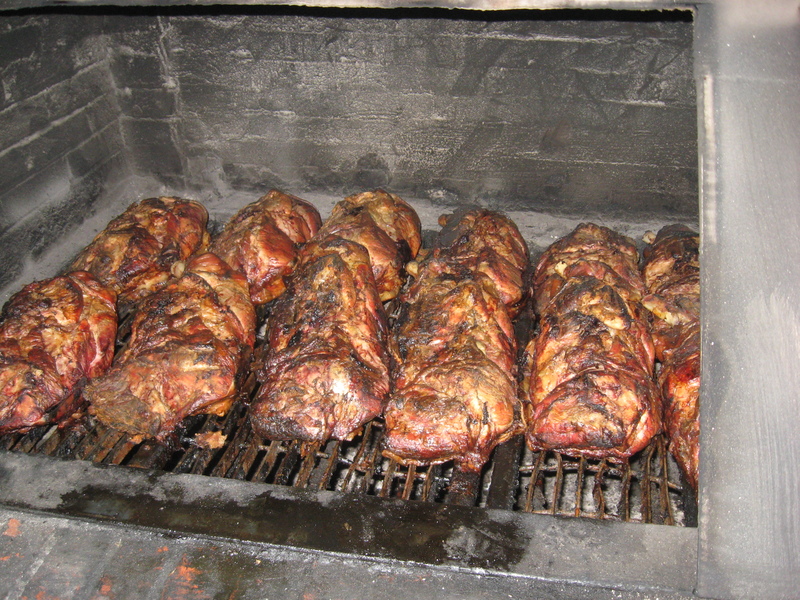 Bridges cooks with hickory and oak wood, and they apply no seasonings of any sort to the shoulders prior to going on the cooker. 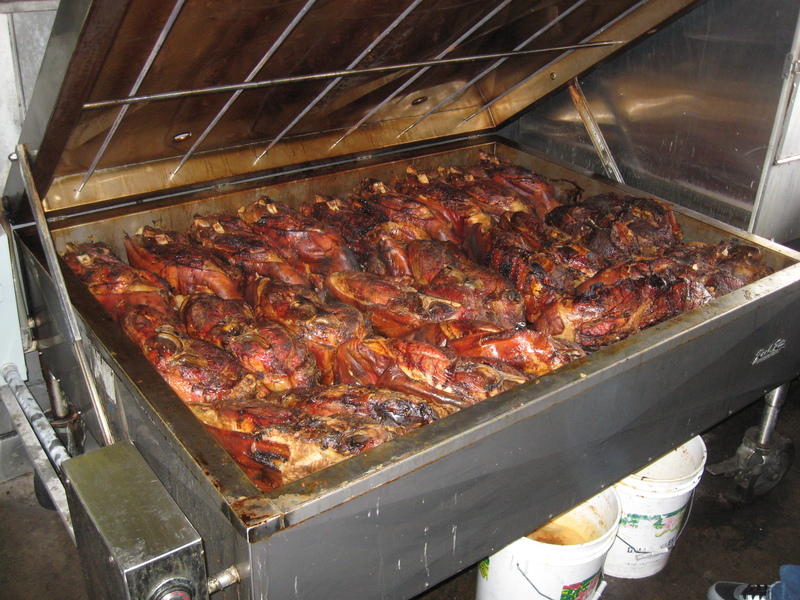 They also have a super-sized smokehouse for when they are cooking for upwards of 10,000 people. 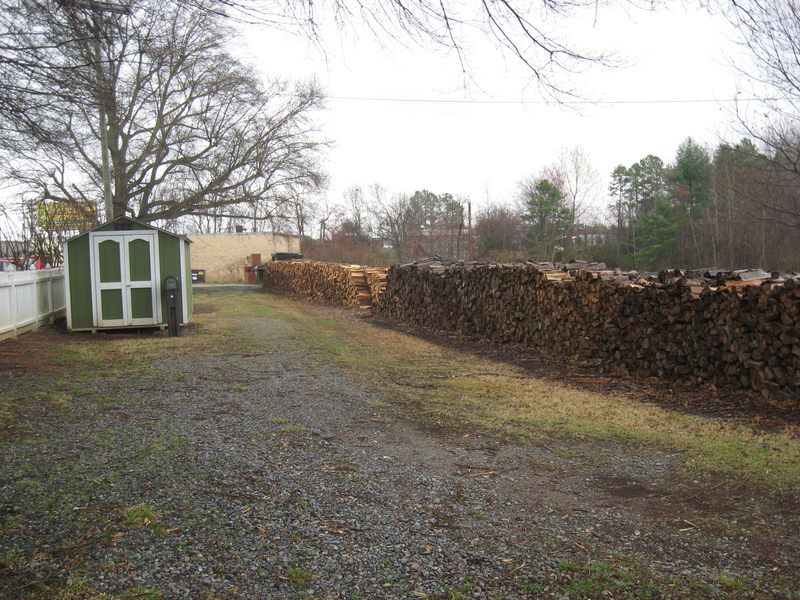 Oh yeah… and they have a little bit of wood stockpiled as well. 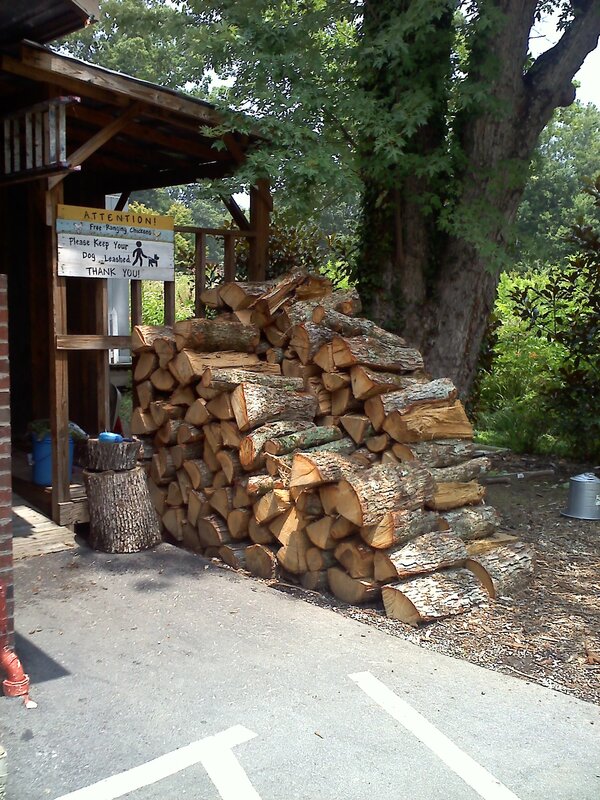 The Woodpile -- That's a lot of wood! 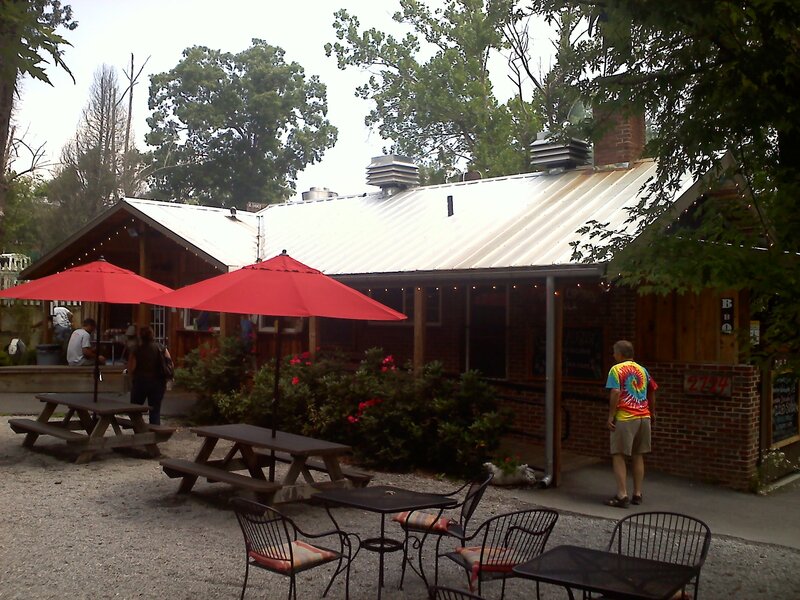 After dining there, I can definitely see why Bridges Barbecue Lodge is on the NC BBQ Society’s Historical BBQ Trail. 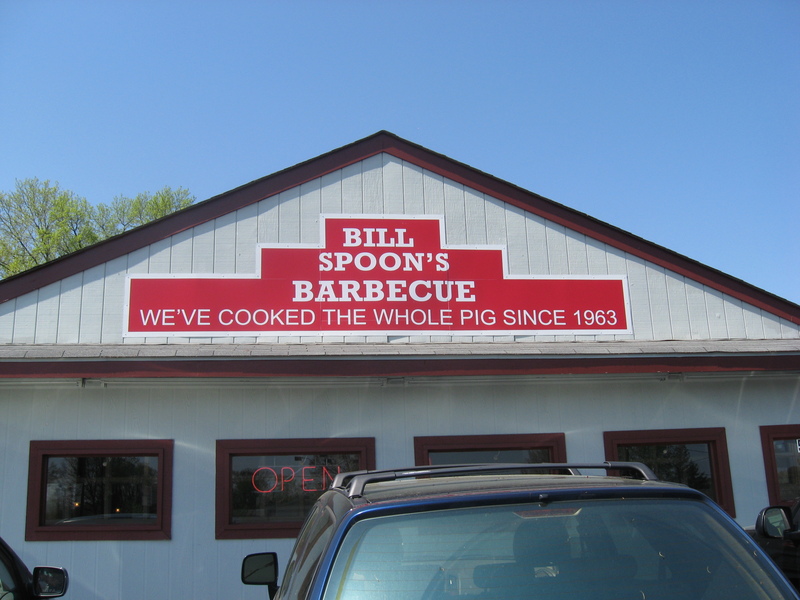 Their reputation is well-earned as a legend in North Carolina BBQ. 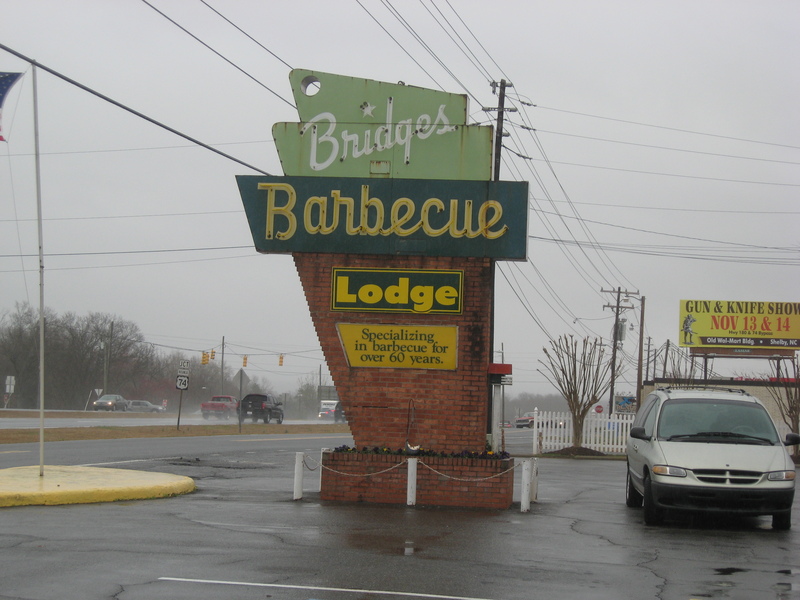 Any visitors to the Charlotte area (yes, I’m talking to you, President Obama) would do well to make the 45 minute trip from Charlotte to Shelby and experience Bridges Barbecue Lodge.